Indications for the need and accuracy of fracture reduction in children are often complex and require good judgment. Base these decisions on underlying principles whenever possible. Unfortunately, data on which to base these principles is limited. Some generally accepted principles can be outlined for different types of fractures. A flowchart is often helpful. Several principles are helpful in deciding whether a fracture requires reduction in the child. Age The younger the child, the greater the potential for remodeling. This is possibly the most important factor. Generally, children under age 10 years can be expected to remodel significant deformity. Bone position Remodeling is greatest near the ends of bones. The amount of remodeling necessary to correct a deformity is proportional to the distance from the adjacent joint. For example, distal forearm fractures remodel much better than midshaft deformities. Plane of deformity Remodeling is usually greater in the sagittal than the frontal planes. Rotational or transverse plane deformity can remodel, but the amount is controversial. One reason for this controversy is the difficulty in assessing and imaging rotational remodeling. Also, the plane of deformity is related to the axis of motion of the adjacent joints. Deformity that lies in the plane of motion of the adjacent joint will resolve or is better tolerated. For example, an anterior or posterior bow of the femur is more accepted than varus or valgus deformity. Growth rate of adjacent physis Accept more deformity close to a physis with a great growth rate and potential. For example, the rapid growth rate of the upper humeral epiphysis contributes to its spectacular remodeling potential. In contrast, growth at the elbow is limited and varus–valgus deformities remodel poorly. Completion of remodeling Remodeling is completed in about 5–6 years. Most occurs in the first 1 or 2 years. Unique features Some malunions remodel poorly. The classic example is the cubitus varus deformity, resulting from malunion of supracondylar humeral fractures. Lateral condylar fractures are prone to nonunion. The reason is unclear. Physeal fracture reduction is well established. SH-3 and SH-4 fractures should be anatomically reduced to prevent physeal bridge formation and reduce the risk of bar formation. 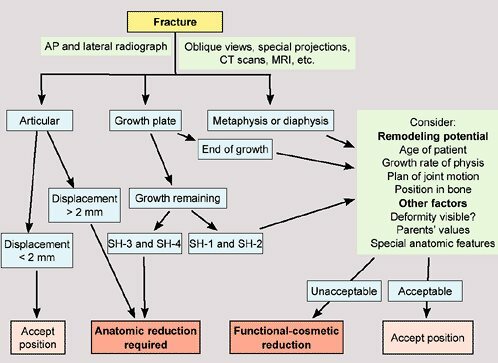 Consider SH-1 and SH-2 fractures like metaphyseal injuries and apply the same principles to make decisions about management. Articular fractures are less common in children than in adults, as the cartilage is more resilient and less readily injured. Some generalizations can be made. Remodeling may correct some deformity Accept more articular deformity in the infant or young child than in older children or adolescents. Consider adolescents like adults. Accept more horizontal than longitudinal displacement A step-off deformity that increases the articular loading may be less acceptable than one that widens the joint. Apply the 2-mm rule Generally, we accept displacement of less than 2 mm. This rule was established based on clinical experience. Be aware that MRI or CT studies will usually show more displacement than conventional radiographs. Indications for open reduction change with time. These indications are affected by social, medical, and economic factors with considerable variation. Some generalizations can be made. Polytrauma suggests multisystem injury, not simply a child with several fractures. Many children with multiple fractures are best managed by cast immobilization, traction, or other noninvasive methods. Economic indications The financial cost of management should be a factor only when deciding between options that are all medically acceptable.